The election of the country’s first President of African descent has created an opportunity for celebration this country has not known before. The inauguration of the 44th President of the United States of America, former Senator Barack Obama, has created an energy and synergy that is being felt throughout our nation and the world. Yes, this is a moment of Jubilee! 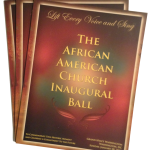 For certain, the African American Church must mark this moment with great pride, honor and power. For today, we stand on the shoulders of so many who bled and died for this moment of witness, of which we consecrate with our joy and commitment to continue to fight for equality and justice for all. For many of us, this is a once in a lifetime opportunity to unite in celebration for an African American President. For our children and their childrens’ children, it is the first of many! Join us for the Jubilee!